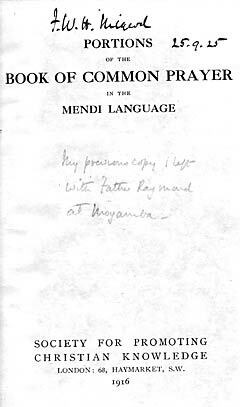 Mende is a Niger-Congo language spoken by about 1,500,000 people, almost entirely in the southeast of Sierra Leone, but also in neighboring Liberia. It is one of the four major languages of Sierra Leone. The Mende people are one of the two largest ethnic groups in Sierra Leone, and have provided many of the political leaders of the country. Sierra Leone was once one of the main sources of slaves for America, and the Mende were no exception. The slaves who rebelled on the Amistad were Mende. Project Canterbury has several original documents tracing the history of the Anglican Church in Sierra Leone during the 19th century. This book is listed in David Griffiths' Bibliography of the Book of common Prayer as 110:1 and is, to the best of our knowledge, the only translation of the Book of Common Prayer into that language. 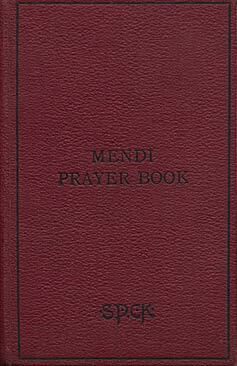 There are a number of books online on the Mende language contempraneous to this one, including a phrase and grammar book, and the Gospels. These, though contemporaneous, use a slightly different orthography. Specifically, instead of the underlined vowels found in this work, they have a dot under, and, instead of the tilde on vowels, they have a macron (line over). One suspects that the printer of this book did not have the required characters and substituted. Note that this text uses several additional diacriticals, one of which may be problematic. This is an "n" with a dot over, which is part of Unicode, but is supported by very few fonts. The font used here, Times New Roman, includes it only in newer versions supplied with Windows Vista and 7. In other operating systems (e. g., Windows XP), you will likely see a box where this character should be. Fortunately, it is seldom used in the text. Entire book as PDF graphics.